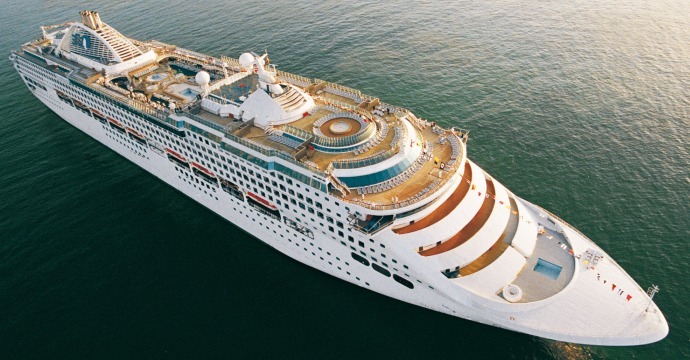 Launched in 1995, the Sun Princess is a ‘Sun-Class’ Cruise Ship which is owned by Carnival Corporation and operated by the Princess Cruise Line. Along with her sister ships, Dawn Princess and Sea Princess, the Sun Princess offers the ultimate luxurious cruise in an elegant and glamorous environment. With a capacity for 1,990 passengers and 900 crew members this exclusive ship offers a spacious cruise at sea with all the comforts of home. From summer 2013, Sun Princess will be the first of Princess Cruises fleet to offer circle trips from Tokyo, Japan. What Are Your Dining Options On-Board Sun Princess? Passengers on-board Sun Princess have numerous dining options to choose from, with traditional dining rooms, specialty restaurants, buffets, grills, cafes and snack bars. The main dining rooms offer traditional dining in elegant and sophisticated surroundings with set dining times for guests who prefer to dine at the same time each day. Various other restaurants offers ‘any-time’ dining options for guests to choose when, where and with whom they dine. For an alternative dining scene, passengers can experience dishes from around the world at the exclusive specialty restaurants. Sample a taste of the Far East in the Asian themed restaurant or enjoy mouth watering beef dishes, seafood and appetizers in the deluxe Sterling Steakhouse. Passengers also have access to 24 hour room service when they prefer to dine in the comfort of their own cabin. When at sea, Sun Princess has plenty daytime entertainment and relaxation on offer, which will be sure to appeal to all passengers. Take a dip in one of the 2 swimming pools, unwind in a bubbling Jacuzzi or partake in a game of tennis, basketball or shuffleboard. Other leisure facilities include, jogging track, various Kids Clubs and a modern fitness gym with treadmills, exercise bikes, rowing machines and weights for passengers to enjoy an energetic workout. For the ultimate in relaxation and pampering the Lotus Spa offers various health treatments to soothe both the mind and body. There is also an exclusive beauty saloon which offers hair-dressing, manicures, pedicures and much more, for those special occasions. What’s The Evening Entertainment On The Sun Princess Like? According to the claims, no one does evening entertainment better than Princess Cruises and Sun Princess is no exception with regular shows, cabarets, dancing and live music on offer throughout the ship. Both the Vista Show Lounge and the glamorous Princess Theatre host regular broad-way style shows, dancing, cabarets and live music which will be sure to captivate and enthrall passengers. The whole family will love snuggling under a blanket and watching a movie under the stars at the exclusive outdoor theatre. Other on-board highlights consist of dazzling nightclubs, lively bars, relaxing lounges and the deluxe Grand Casino where guests can try their luck at the many thrilling games on offer.